The Tuna and Krill boilie has taken inspiration from some of our best and well established baits such as a couple of key ingredients from the best selling Virus boilie which has an incredible track record with big fish and a few items from the awesome Moorlands Mix that help promote incredible growth rates to which we have added Krill powder, low temperature fishmeal’s, salmon meal, tuna meal, calcium cassinate, egg albumen, semolina, a unique blend of spices ,milk replacers and a ph adjusting additive . The liquid attractors include an incredibly effective blend of Tuna and Butyric whilst the addition of the amazing Krill hydroslate liquid really sets this bait apart from the crowd and the finished product is a classic dark red / warm brown colour which is a firm favorite of many big carp anglers. 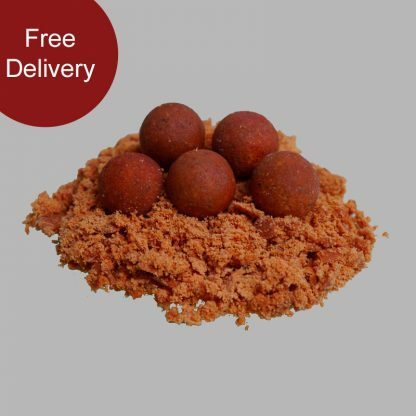 The Tuna and krill really is an exceptional bait suitable for any venue regardless of difficulty and can be applied with confidence throughout the year due to its extremely digestible construction.